They are the original “Ram Lakhan” of Punjab. Pash and Das or Chief Minister Parkash Singh Badal and his brother, Gurdas Singh Badal, have been inseparable through thick and thin. From the papers that former Finance Minister Manpreet Singh Badal released to the press today it became expressly clear that Manpreet was not talking through his hat about the debt waiver, as his detractors had alleged. While Manpreet Badal launched a scathing attack on his cousin and Deputy Chief minister Sukhbir Singh Badal after being sacked today, the latter chose not to react to his outbursts. 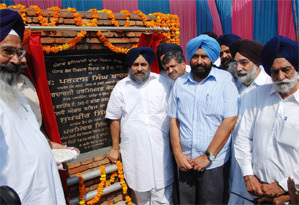 Sukhbir Singh was interacting with mediapersons after inaugurating the Rs 70-crore railway underbridge (RUB) here. Following the recent developments in the SAD and the SAD-BJP government, Punjab Congress President Mohinder Singh Kaypee stated that Manpreet Singh Badal was left with no option but to resign as the Finance Minister after his suspension from the party. Talking to The Tribune, Kaypee said hostility between the Badal families had been going on for the past some time but now it had also entered the state government. So much so, understanding within the government had ended on the issue of the debt waiver. The Shiromani Akali Dal MLA, Sant Ajit Singh, from the Anandpur Sahib constituency and Independent MLA Charanjit Singh Channi from the Chamkaur Sahib constituency have pledged their support to former Finance Minister Manpreet Badal. With the laying of the foundation stone of the SGPC’s sub-office in Kurukshetra yesterday, a fresh round of a bitter battle between the SGPC and the Haryana SGPC (ad hoc) is on the cards as the latter is gearing up to submit a proposal to the Haryana government for a separate gurdwara panel. Farmers waiting for sale of their paddy crop in Rajpura grain market narrated their woes to Food Corporation of India (FCI) zonal manager, Delhi, Pradeep Kumar Pujari during his visit today. 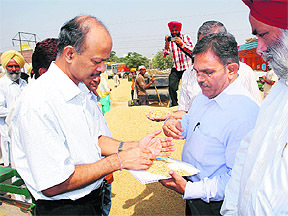 Senior regional manager Nilkanth S Avhad and other officials of the FCI accompanied the zonal manager. Farmers complained that procuring agencies were not purchasing their produce and many farmers were forced to stay in grain market for more than two days. In order to keep players away from drugs and apprise them of their ill effects, the World Anti-Doping Agency (WADA) is looking forward to work with their Indian hosts at NADA to assist them in establishing a national awareness programme based on the WADA’s Outreach Model. This step has been taken to ensure that all players, including international and budding players, are fully equipped with knowledge about various drugs. With migrant labourers from Uttar Pradesh heading home to participate in panchayat elections (held from October 11-25), the state industry and agriculture are facing acute labour shortage. With 60 per cent of the migrant labour coming from UP, the agriculture and industry sectors are facing hard times owing to harvesting and hosiery season. The Kahnpur-Bhangla 7-km road stretch will be laid bringing major relief to the villages that have been facing problems due to the badly damaged road. Over 10 stone-crushing units dot this road. Heavy and overloaded vehicles plying on the stretch damaged the road beyond repairs. 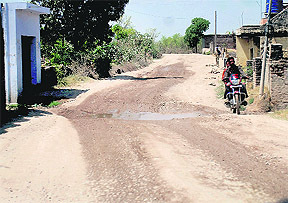 This is the only road connecting villages with city, which has been rendered unmotorable. The National Institute of Visually Handicapped has sanctioned raw material worth Rs 4 lakh to the Patiala district rehabilitation centre for the manufacturing of artificial limbs and tricycles. A two-day UGC-sponsored National Conference on the ‘Life and Ideology of Shaheed Bhagat Singh’ concluded at the Punjabi University Guru Kashi College today. The conference started yesterday with the Punjabi University anthem followed by welcome address by principal Prof Vijay Kumar. Chief Minister Parkash Singh Badal has been discharged from the PGI after six days of treatment here today. Badal was admitted at the PGI on Thursday when he slipped from stairs of his official residence while going for morning walk. Cabinet minister Sewa Singh Sekhwan is making all out efforts to eliminate a former member of SAD’s working committee for pursuing a case against him, the Punjab and Haryana High Court today heard. Six persons of a family were killed in a head-on collision between a bus and a car that took place on the Bathinda-Chandigarh road near village Jethuke in the district, late this evening. Today, however, a line has been drawn and the mutual love and respect the brothers have for each other is threatened with one brother removing the other’s son -- Manpreet Singh Badal from his Cabinet. Asked point-blank whether he felt that injustice had been done to his son, he said, “Earlier I never felt so, but today, yes, I feel a great injustice has been done to him.” In reply to another question as to whether the Chief Minister had called him to his bedside at the PGI where he was recuperating, Gurdas Singh said, “Pash asked me to come to him a few days back but I treated the issue lightly as I never realised it would take this turn.” He said the Chief Minister had finally called him yesterday and said they should sit together and resolve the issue. Manpreet’s father has only good words to say about the Chief Minister, saying the latter loved him more than he could ever do so. But he is bitter at the turn of events. He said the issue was not of dropping Manpreet from the Cabinet but that of the manner in which it had been done. He said Manpreet had only Badal to thank for his studies as well as being made a legislator and a minister. “There is no question of not agreeing to anything the Chief Minister says,” he added but had no answer as to why Manpreet refused to follow the Chief Minister’s diktat by calling off the press conference, which led to his son’s ouster today. Deputy Chief Minister Sukhbir Badal had gone on record last week that there was no “formal” offer from the Union Government about the debt waiver. Going by the papers released by Manpreet today, Sukhbir’s statements now seem to be a bunch of “clever lies”. While this is an offer letter for the beginning of negotiations with the Centre on the issue of debt waiver, Sukhbir Badal, however, had accused Manpreet of having no offer letter that spelt out the “quantum” of the debt waiver. There also seems to be no justification of what Chief Secretary SC Aggarwal along with Finance Secretary KBS Sidhu stated in their recently held press conference. A host of other papers show that the two officers knew what was going on. Following this offer, two meetings of this committee were held on August 10 and August 20 to discuss Punjab’s case. Both these were attended by the Finance Secretary. A detailed note on Punjab’s finances were also put forth by Sidhu during these meetings. Following these meetings, a detailed note of the proposed offer was prepared by the Finance Department listing out the conditions put forth during these meetings on August 25 to be put up before the CM. The note said the Centre wanted a response from the state government on the conditions it had listed out and the matter be discussed by the Cabinet subcommittee on additional resource mobilisation. 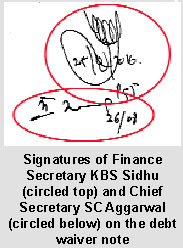 This note containing the conditions laid down by the GoI was signed both by KBS Sidhu and SC Aggarwal. “This note was prepared by our people here based on the meetings held with the central committee. There is no letter whatsoever from the Centre about these conditions or the quantum of the debt waiver,” Aggarwal clarified today. “When the note came to me, I took it to the Chief Minister, who suggested that I bring it before the Cabinet for which a power point presentation was prepared by Sidhu. The presentation was then shown to the Cabinet on September 17,” said Manpreet today. Manpreet then talked about the loan-waiver offer on the floor of the House this month. In his speech to the House (extracts of which were released by him today) Manpreet had pointed out that the exact amount of the debt waiver would be possible to know only once the state forwarded a “politically approved” plan of action in this regard. Sukhbir Singh refused to get provoked by the volley of questions by newsmen and kept repeating, “Manpreet is my brother and I do not want to comment on the issue.” However, without naming Manpreet, he said the “party is supreme and nobody is above it”. When asked whether Manpreet’s suspension from the party could be seen in the context of a war of succession between the two scions of the Badal family, Sukhbir denied this and said “his suspension was a decision based on the recommendations of disciplinary committee of the party that I accepted in my capacity as the SAD chief”. Replying to a query as to why the family feud came in the way of accepting the Centre’s loan waiver offer, Sukhbir Singh said, “We are not against the waiver but the issue was that the Punjab government was not aware of any such offer from the Centre. We want that the Centre must write off the debt without any pre-conditions and there should be an official communication from the Centre to the Punjab government instead of taking up the matter with some individual.” “Chief Minister Parkash Singh Badal and I were continuously writing and meeting the Prime Minister, Finance Minister and Planning Commission for a loan waiver. Besides, the Bathinda MP, Harsimrat Kaur Badal, had also forcefully raised the issue in Parliament, which is enough to show how serious we were in pursuing the loan waiver,” said Sukhbir Singh. Following the recent developments in the SAD and the SAD-BJP government, Punjab Congress President Mohinder Singh Kaypee stated that Manpreet Singh Badal was left with no option but to resign as the Finance Minister after his suspension from the party. Talking to The Tribune, Kaypee said hostility between the Badal families had been going on for the past some time but now it had also entered the state government. So much so, understanding within the government had ended on the issue of the debt waiver. Meanwhile, CLP leader Rajinder Kaur Bhattal said Governor Shivraj Patil should dismiss the SAD-BJP government as the Punjabis in general were being affected adversely with the internal fighting in the SAD and the government. The CLP leader further said the Governor should intervene into the recent developments to end the constitutional crisis and ask the SAD-BJP government to face a confidence motion, failing which he should dismiss it immediately. Bhattal said the infighting in the ruling SAD was only an effort of the Akalis to take credit for the debt waiver offer. Meanwhile, an alliance partner in the Punjab government, the BJP sees no threat to the regime following Manpreet’s resignation after his suspension from the SAD. Talking to The Tribune, Local Bodies Minister Manoranjan Kalia said there was no threat to the SAD-BJP government as the alliance enjoyed a majority even after Manpreet’s resignation. However, he refused to comment on the recent developments, stating that this was an internal matter of the Akalis. Anandpur Sahib this morning to meet Sant Ajit Singh. Independent MLA Channi, too, was repeatedly sent messages dissuading him from supporting Manpreet. 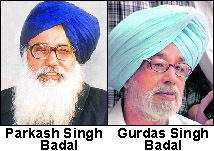 Sant Ajit Singh has been very close to Chief Minister Parkash Singh Badal. Being one of the oldest party leaders, the Chief Minister is known to respect him and acknowledges it publicly. While Sant Ajit Singh had decided to throw his weight behind Manpreet, party insiders observed that such a senior leader’s move against Sukhbir showed that even senior leaders trusted Manpreet more than his cousin, Sukhbir. Apart from Chandumajra, other Akali leaders, including Jagtar Singh Bhaini, tried to persuade Sant Ajit Singh to not support Manpreet, but to no avail. “I stand by Manpreet, no matter what happens. I am first a religious person, then a politician. I will stand by him through thick and thin. I do not have any vested interests to garner from politics,” he said. Talking to The Tribune over the phone from Haryana today, president of HSGPC (ad hoc) Jagdish Singh Jhinda rejected the SGPC move to set up a sub-office in Kurukshetra and stuck to his demand for a separate panel. “We will settle for nothing less than a separate gurdwara committee for Haryana,” he said, adding that even the SGPC secretary, who had been made in charge of the Haryana affairs, did not belong to the state. “He is from Punjab and he hasn’t got any powers to take a decision,” he charged. However, he hailed the SGPC’s decision to establish schools in Haryana and hoped that the announcements would not remain on paper. Jhinda claimed that the SGPC was forced to make these announcements due to the pressure regarding the formation of a separate SGPC in the neighbouring state. He alleged that out of 11 SGPC members from Haryana, only four were invited to the foundation-laying ceremony in Kurukshetra yesterday. Jhinda also said that Haryana Chief Minister Bhupinder Singh Hooda had sought a proposal from them for a separate gurdwara committee. “We will submit our proposal to the state government within 15 days after holding consultations with the Sikh sangat as well as legal experts,” he added. On the other hand, SGPC chief Avtar Singh said the Sikh sangat of Haryana was with them and they did not need a certificate from Jhinda for what they were doing. "Whatever steps we are taking is for the welfare of the Sikhs in Haryana and better management of the shrines in the state." He also dubbed Jhinda as an “agent of the Congress”, while alleging that the move for a separate gurdwara committee had been instigated by the Haryana Congress. He said there was never a demand for a separate gurdwara panel from the Sikhs living in Haryana. Avtar Singh had announced the setting up of the SGPC sub-office at Gurdwara Sahib Pahili Patshahi ‘Sidhwati’ in Kurukshetra yesterday. He also announced the establishment of schools in Pinjore, Karnal, Kurukshetra, Jind, Kaithal and Yamunanagar. He said around 100 staff members for the SGPC sub-office would also be recruited from Haryana. They are not purchasing paddy over one pretext or the other. Most of farmers are told that their produce had moisture content more than permissible limits, said Ajaib Singh of Chanduan Khurd village, near Rajpura. He lamented that farmers were forced to stay overnight in grain market in view of slow purchase of paddy. Farmers also face stray cattle menace in market. Animals spill out grains on roads that gets trampled by people and moving vehicles leading to further damage of grain, said another farmer Gurmail Singh. Ajaib alleged that section of commission agents did not allow some farmers to express their problems to officials visiting grain market today. Kuldeep Singh from Thuha village, near Rajpura, said he sold off two trolleys full of paddy in the past four days. “Despite the fact that grains did not have moisture, the authorities told me to dry it in front of a fan for which I was charged Rs 1.60 as fan charges and Rs 2.52 labour charges for every 35 kg of paddy,” said Kuldeep Singh. He lamented that some of the grains of non-recommended hybrids 257 and 2961 failed to ripe uniformly and they were still green in colour. Uneven maturity of paddy plants has lead to chaos. Market committee officials, after detecting green grains, declare produce as high moisture content and fear that it could damage ripened paddy grains as well, said farmers. Farmers lamented that they had purchased hybrid seeds of paddy at a cost of Rs 200 per kg, which failed to give good results, and they had been facing problems in selling their crop. Market committee secretary Harvinder Singh did not agreed over problems highlighted and said they were trying their best to provide basic facilities to farmers in the grain market. He said 3.45 lakh quintals of paddy was procured last year till date, however, this year nearly 3.96 lakh quintals of paddy had been purchased in Rajpura grain market this season. At present, only 5,000 quintals of paddy is lying in the market, which is yet to be procured due to high moisture content. Giving information in this regard, Rahul Bhatnagar, Director General of NADA, informed that WADA organised similar Outreach Programme during the Commonwealth Games to raise awareness about anti-doping issues with direct interactions with athletes and sports officials. The programme was organised considering the participation of over 7,000 sportspersons from 71 Commonwealth countries. “During the Commonwealth Games, WADA operated this programme for nine days from October 3 until October 11 at the Games Village with much success. Thousands of athletes voluntarily visited the programme during this time. The programme included 10-question quiz and if the participant got eight correct, they won a WADA cap and sports ball. They were then able to take a picture and have their image on the cover of WADA’s Play True magazine,” he added. The Outreach Programme also recruits an international team of anti-doping experts to support their activities. During the Commonwealth Games, WADA utilised the expertise of five individuals, including Ankush Gupta, National Anti-Doping Agency of India, Leslie Buchanan, International Triathlon Union from Canada, John Osawa, Doping Control Officer from Kenya, Wendy Henderson, Education Officer from Northern Ireland and Tasi Toalima, Doping Control Officer from Samoa. Anil Kumble, who is a member of the WADA’s Athlete Committee, also joined the programme to help support clean sport. Each worker is being offered Rs 2,000, to and fro rail fare and food during his stay. That is why they are going back home. With migrant labourers from Uttar Pradesh heading home to participate in panchayat elections (held from October 11-25), the state industry and agriculture are facing acute labour shortage. With 60 per cent of the migrant labour coming from UP, the agriculture and industry sectors are facing hard times owing to harvesting and hosiery season. This time the number of migrant labourers going back home is comparatively high as they are being given lucrative offers to caste their right to vote. 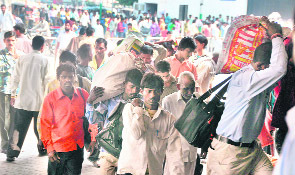 “Each worker is being offered Rs 2,000, to and fro rail fare, food and drinks during their stay. That is why they are going back home,” said Badish K Jindal, chairman of the Punjab Chapter of the Federation of Associations of Small Industries of India. Yogesh, working in one of the hosiery unit in the city, says he is going home since one of his relatives is contesting elections. “Moreover, they are paying for my railway tickets and have also promised to compensate me by giving me the amount that I would have earned here. It is a win-win situation for me and I will also meet my family,” he said. According to industrialist Satish Aggarwal the elections have result in 35 per cent of labour shortage in the state. “There is already shortage of labour and now with the workers moving to their home states for elections will further make the problem more serious. Festive season is on and under the present circumstances industry is facing losses,” he added. Aggarwal further said migrants were being offered a hefty sum and this is the reason why they were not giving a second thought before leaving. “One of the workers in my factory told me that he is not paying anything for the ticket or during his stay at home,” he added. A farmer, Harpreet Singh, said they were finding it difficult to hire labour for harvesting. ‘‘Almost all of them are returning home,’’ he said. Demanding immediate carpeting of road, villagers have even staged a protest and jammed the traffic. An eleven-member committee, including owners of crushing units and SDM Anandpur Sahib APS Sandhu, met Deputy Commissioner AS Miglani. Miglani said funds to the tune of Rs 2 crore would be provided from Chief Minister’s funds as well as with contribution from owners of the crushing units. Already the proposal to lay road has been drafted under the Pradhan Mantri Gram Sarak Yojana. It has been proposed that the road be widened from the present 12 feet width to at least 7 metre. The road would be laid keeping in view of the heavy flow of traffic. Introducing the theme of the conference, Prof. Amandeep Singh said Bhagat Singh was judicially murdered by the British Empire 79 years ago but the legacy of his ideology and life lives on as symbols of revolution. “Majority of politicians have nothing to do with his ideology but to derive political benefits out of it. Many historians too interpreted Bhagat Singh according to their own vision of future and not what the martyr had envisioned,” he added. In a petition placed before Justice Surya Kant, petitioner Yadwinder Singh Butter of Butter village in Gurdaspur district alleged: “Sekhwan is making all efforts to get the FIR cancelled or get me eliminated”. Taking cognisance of the allegations, Justice Surya Kant has directed the State of Punjab and others to produce the report pertaining to the alleged threat perception assessment on the next date of hearing. Justice Surya Kant also directed the Batala SSP to provide a personal security officer to the petitioner. The case will now come up on October 26 for further hearing. Seeking the quashing of the order dated August 31 passed by the ADGP (Security), Butter had earlier alleged that the security provided to him was withdrawn arbitrarily under political pressure. The order did not mention any reason or explanation. It was passed “even though there was grave threat to the petitioner’s life at the hands of Sekhwan and his supporters”. The petitioner had stated that he was pursuing an FIR dated February 23, 2008, for rioting and other offences registered under various Sections of the IPC, and the Arms Act. The FIR was lodged after an attack on the petitioner. The accused, he had added, were found guilty by the Crime Branch, Amritsar, vide its report dated April 13, 2009. The car was overtaking a vehicle when it rammed into a bus coming from the opposite direction killing all six persons in the car on the spot. It is learnt that one Jagtar Singh of Kalyan Sukha village along with his son, two nephews, a brother-in-law and a son-in-law was returning after attending his son’s engagement ceremony that held at Tapa town, today. Near village Jethuke, the driver of the car (Alto) attempted to overtake a vehicle and hit a bus belonging to Libra Transport, plying en route Bathinda-Tapa. The collision was so forceful that the car was badly damaged and its parts were scattered all over. Immediately, a number of people assembled there and pulled the injured out of the car. Though, they appeared to be dead, they were rushed to the Civil Hospital Rampura, where doctors confirmed them brought dead. According to police sources, the deceased were identified as Jagtar Singh (35), his son Beant Singh (17), nephews Amandeep Singh (18) and Gurlal Singh, brother-in-law Gursewak Singh (55) and son-in-law Darshan Singh (25). The post-mortem will be conducted on Thursday morning and the bodies were kept in the mortuary of the hospital. Though the Rampura (Sadar) police reached the spot, they were awaiting the statements of the kin to register a case against the bus driver, who had reportedly fled from the spot leaving the bus behind.